New SimpliSafe Camera Introduced, but How Does it Perform? If you’re a home security system, you can’t fully protect a home unless cameras are a part of your product offering. For the majority of its time as a brand, that was the case with SimpliSafe. The company operated as DIY home security setup, equipped with monitored service, but lacked cameras to do one of the essential jobs of home security. Fast forward a few years and SimpliSafe released their first installment of home security cameras. The products are black and ventures away from the rest of the brand’s all-white, moderately outdated aesthetic. How well do these cameras perform, and do they propel SimpliSafe forward as a bigger player in the home security sphere? Also is my video live with simplisafe? The camera comes equipped with night vision, 120° diagonal field of view, 720p HD video, night vision, a status light, and it connects with the rest of the SimpliSafe system as an intelligent event-based recording device. SimpliSafe claims that the tool will capture all of the moments that really matter. For users who are worried about the camera remaining on and recording while they are in the home, SimpliSafe has installed a privacy shutter that allows users to close the lens whenever they decide on a night in or need some privacy. The camera costs $99 and for $4.99 a month per camera, users can capture and store footage in an event timeline that can store clips for 30 days. Purchase is available through the app that runs the SimpliSafe system. Similar to other DIY and smart device integrated home security systems, SimpliSafe will send you alerts via push notification. Alerts are sent to view footage anytime someone disarms or arms the system or if the alarm is triggered. Night vision is equipped as well, and the company says they have super crisp footage in the dark. Monitoring for a SimpliSafe system costs $0.50 cents a day for their standard plan, or the higher-tier interactive plan can be purchased for $0.83 cents a day. The layout of the monitoring on the SimpliSafe website is confusing to navigate, however, because they do claim that monitoring is $14.99 a month. But with the SimpliSafe monitoring option, authorities will be alerted if anyone breaks into the home. SimpliSafe has been a well-reviewed security system and people seem to like it, but the new camera hasn’t been out long enough to get a firm understanding on how well it performs. One of the main concerns with SimpliSafe is that researches have reported that they can remotely disable the system and burglars may also be able to jam the system. Neither of these are particularly reassuring notes when it comes to a device that is meant to protect your home and family. The packages also start at a very high price. They offer five different packages that range from $229.96 to $539.85. These are one time fees, but since you’ll likely be paying for monitoring as well, these are large upfront prices to be paying for a security system as simple as SimpliSafe. SimpliSafe doesn’t offer much of the home automation tools that have become prevalent across the industry. 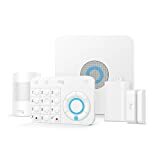 It doesn’t connect to Z-Wave, Zigbee, or any other wireless networks, and it doesn’t provide the different camera, main station, and product offerings that other home security systems offer. So you won’t be able to connect with lights, locks, garages, or other parts of the home. They devices themselves also look rather outdated. For those who are looking for a simpler product, SimpliSafe could be an option, but we suggest opting for a bigger offering with more options, coverage, and more abilities within the home. Our previous blog post will give you a more in depth look at the SimpliSafe system.